London’s beauty charms us every spring. When the days get warmer and the trees burst into blooms, the parks and gardens turn vibrant green and the sun shines, London is irresistible. This year spring hasn’t been particularly springy … and mother nature has taken her good ol’ time warming things up in the UK. The sun has finally came out in London, and with it everyone who has been so eagerly waiting some fine spring weather. 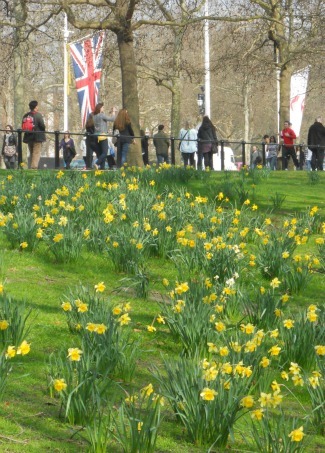 Here are some cheery pictures of London in the springtime that will bring a smile to your face! These pretty white blossoms below were taken along one of our favorite streets near Kensington Gardens between Kensington High Street and Notting Hill Gate. It’s such a peaceful and charming residential neighbourhood, and it’s where you’ll find our new Halifax one bedroom apartment and nearby the Palace Gardens apartment, the gorgeous six bedroom Brunswick home and the charming Lancaster one bedroom vacation rental. 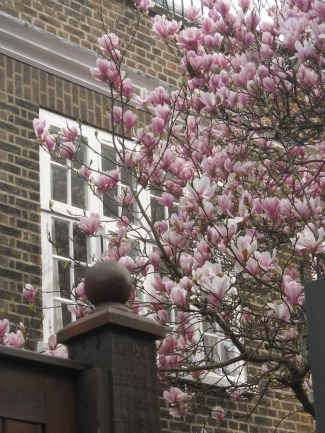 Guests love walking in Kensington along the quiet residential streets lined with Victorian homes and beautiful trees! 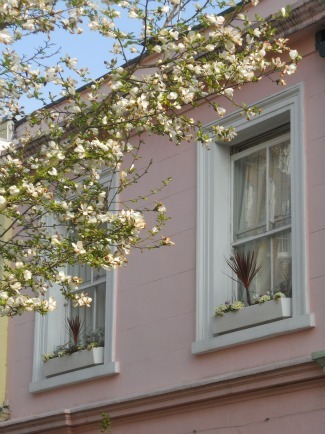 Notting Hill is one of London’s most colourful neighborhoods, and the spring blossoms blend right in. Here’s a pink house we saw on the way to the Portobello Road Market recently that was even brighter than the blossoms out front! 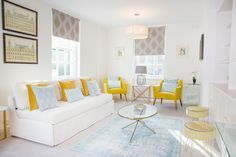 If you’d like to stay near the world’s most famous antiques market, check out the lovely Marlborough two bedroom mews home and our Princes Square vacation rental with private garden in Notting Hill. 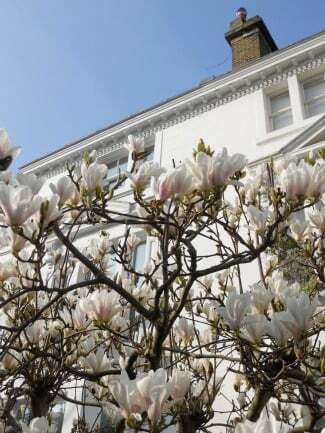 Notting Hill is picture perfect in the springtime! When spring arrives and the weather is nice, everyone heads to the nearest park. If you’re out sightseeing, be sure to plan your itinerary to walk through parks and gardens in London, too. The daffodils are a springtime favourite of mine, and after visiting Buckingham Palace last spring I took a stroll over to nearby St. James’s Park. That’s where I found this hillside of daffodils with the Union Jack in the distance. 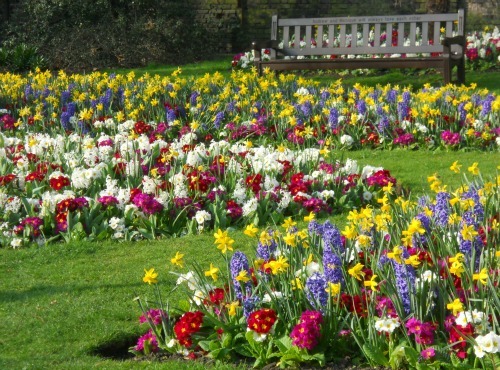 London’s top spots are lovely in the springtime, with the bursts of spring colours from trees and flowers that are such a welcome sight after the winter. 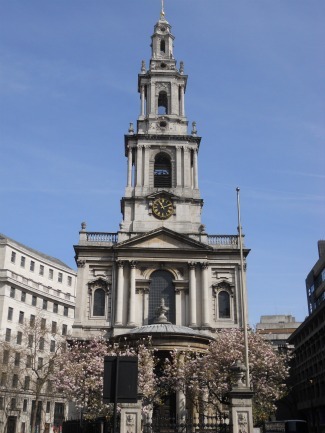 I spotted the trees blooming in front of the St. Mary-le-Strand church designed by James Gibbs (1682-1754) near the Somerset House and the beautiful Eden studio rental near Trafalgar Square. 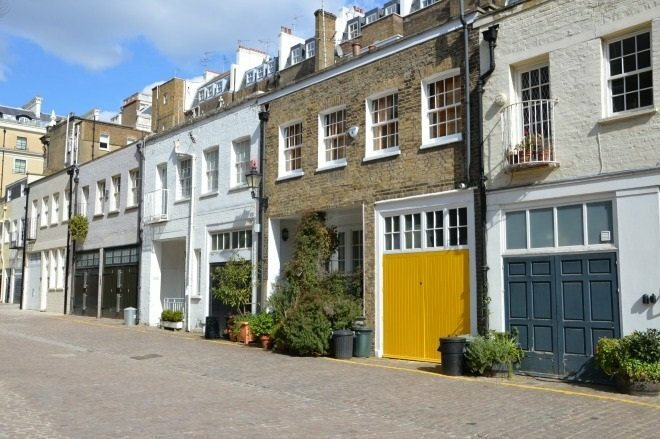 Walking along the quiet residential streets of Chelsea is always a pleasure. But it’s especially pretty when the trees blossom in the springtime with their pinks and white the perfect contrast to the rows of red brick buildings. 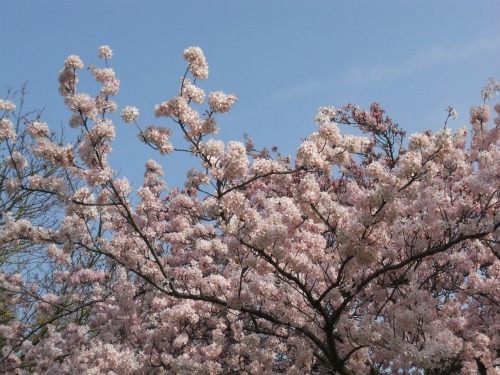 These pink blossoms were taken just around the corner from our Hamilton one bedroom vacation rental between King’s Road and the Thames. Have you taken photos of London during your travels this spring? We’d love to see them! 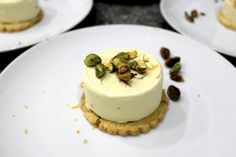 We invite you to share your favourites on our London Perfect Facebook fan page. Happy spring from London! 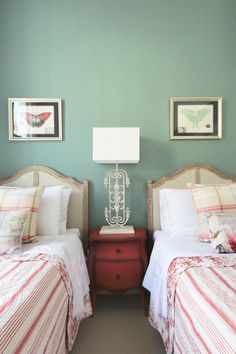 Posted on Monday, April 15th, 2013 at 9:42 am in See & Do. You can follow any responses to this entry through the RSS 2.0 feed. You can leave a response, or trackback from your own site.